Limitless Recap: Sands of CrimeWhat do we really know about Bradley Cooper’s right-hand man? Limitless Recap: Uh, Bollywood?So, Limitless is getting kind of stale. Limitless Recap: A Bazillion Creepy RobotsWho else wants to know more about the guy dating a robot in his basement? Look Who Guest-Starred on The X-Files Before They Were FamousFeaturing a pre–Even Stevens Shia LaBeouf. Limitless Recap: Cuddled to Death by a Serial HuggerIs there an out-of-the-blue explanation for this week’s mystery? Of course there is. Everything We Know About Future Star Wars MoviesTL;DR: You’re deeeeefinitely set on Star Wars through the end of the decade. Limitless Recap: Is Bradley Cooper Actually a Bad Guy?Brian learns that Bradley Cooper is (maybe) evil. Chip Zdarsky on Kaptara’s He-Man InspirationAlso, everyone in the Archie universe is extremely horny. The 10 Best Viral Videos of 2015Time to open your eyes to all the beauty in the world, and also, bears. Limitless Recap: More Pills, More ProblemsSomeone else finally becomes Limitless. References to Fargo the Movie in Fargo S2Oh yah. What We Learned From the 18 New Star Wars BooksSome are worth reading! Others, not so much. Limitless Recap: A Farewell to ArmsThe show hints at a not-so-distant future where robots kill us all. Limitless Recap: Boring Stuff, Cool StuffBrian sweeps the Top Ten. Limitless Recap: Who Are These Randos?The hot streak comes to an end. How Gay-Themed South Park Fan Art Wound Up on the ShowTalking to the Tumblr and DeviantArt users who were surprised to see their work on South Park. Limitless Recap: Bradley Cooper’s Back to Bother BrianBrian learns that drugs can be bad. Limitless Recap: Brian Gets Into VloggingAlso, Brian gets a guy killed. Limitless Recap: Some Light TreasonIt’s possible that Limitless is getting a bit overstuffed. Limitless Recap: The NZT Inside Us AllThis week’s Limitless featured a one-handed Finnish biathlete turned cartel sniper. But we’re getting ahead of ourselves. How NASA Would Rescue Someone From MarsCould the thrilling rescue in The Martian happen in real life? Everything We Know About the New GhostbustersIncluding Channing Tatum’s Ghostbusters 4 fantasy and the status of slime 2.0. Joaquin Phoenix Movies to Stream During Hurricane JoaquinWait, doesn’t everyone theme-out their storm weekends? Limitless Recap: Brian = TerribleLimitless wastes absolutely no time getting weird. Limitless Recap: Kills for PillsBradley Cooper–Voiced Baby looks to be the breakout star of 2015. WHAS: FDOC Recap: The True Meaning of KibbutzThere’s not a single death in this episode — unless you count Kevin dying inside. How The Daily Show Progressed From Fart Jokes Into a Lean Satire MachineThe show has changed profoundly since ‘99. Wet Hot American Summer: First Day of Camp Recap: Filet Mingong“Electro/City” is not only the best episode of Wet Hot American Summer yet, it is also the best episode of television I’ve seen this year. Wet Hot American Summer: First Day of Camp Recap: Heart Attack of LoveThe Falcon is revealed. WHAS: FDOC Recap: Rock and Roll and the WorldCan Lindsey really pass for a 16-year-old? Yes, with a single, well-placed hair clip. WHAS: FDOC Recap: Nobody Looks a Day Over 40Welcome back to Camp Firewood, again, for the first time. CSI: Cyber Screencap Recap: This Is the End … for NowCybercrime expert Ted Danson. Perfect. Can’t wait. CSI: Cyber Screencap Recap: Don’t Do DrugsOr sell them! CSI: Cyber Screencap Recap: Airplane EditionThere’s a perilous airplane situation going on! Agent Mundo needs two phones to handle it. CSI: Cyber Screencap Recap: Beware Location ServicesAre your selfies setting you up to be murdered? According to CSI: Yes, absolutely, 100 percent yes. CSI: Cyber Screencap Recap: The Cruel KidsThese are some very docile internet comments! The CSI team should check out YouTube sometime. CSI: Cyber Screencap Recap: We Learn What Crowdsourcing IsCSI: Cyber: the show that asks not if your iPad will kill you, but when. CSI: Cyber Screencap Recap: Ride-Share Apps Are for KillersThere’s a killer en route! 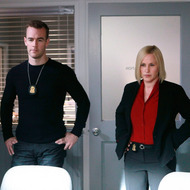 CSI: Cyber Screencap Recap: Computers Most Certainly Will Kill You“Tell the hacker, ‘I’m incredibly aroused by your promise of a spectacle,’” says Oscar winner Patricia Arquette. John Darnielle Explains His Cultural InfluencesDarnielle’s novel Wolf in White Van is out this week. Here Is Everything We Know About The Avengers 2: Age of UltronThere is a lot.